International organisations and development partners committed to supporting Vietnam in implementing projects that make the Mekong Delta more resilient to climate change impacts. The “Conference on sustainable and climate-resilient development of the Mekong Delta of Vietnam” was held in Can Tho City on September 26-27. The World Bank (WB) will coordinate with the Mekong River Committee to assist Vietnam in devising a Mekong Delta Master Plan, which will identify long-term solutions and strategy based on existing knowledge of and expertise on the state of the delta, WB Vietnam Country Director Ousmane Dione told the Vietnam News Agency on the sidelines of the “Conference on sustainable and climate-resilient development of the Mekong Delta of Vietnam” held in Can Tho City on September 26-27. 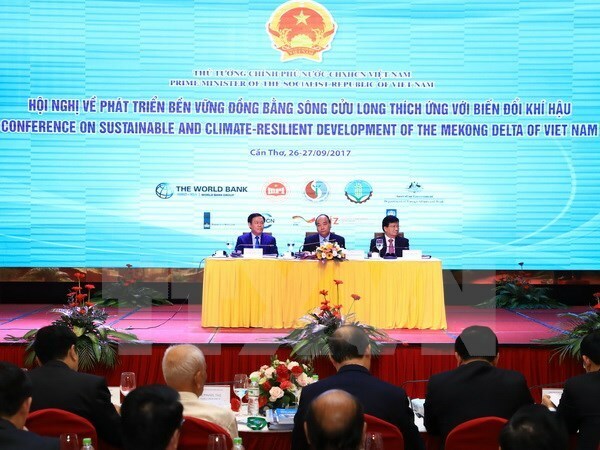 According to the WB official, the WB will also carry out the Mekong Delta Integrated Climate Resilience and Sustainable Livelihood Project, aiming to not only boost regional economic growth but also improve living standards for local residents. In addition, it has been working with ministries of Vietnam to build freshwater supply networks in seven southwestern cities and provinces and to invite investment in developing inland waterborne transport and logistics for the Mekong Delta. Infrastructure development integrated with improved livelihoods and climate resilience will be an effective solution towards sustainable socio-economic growth for the delta, Dione said. Louise Chamberlain, United Nations Development Programme (UNDP) Country Director in Vietnam, said the UNDP will assist Vietnam in increasing resilience capacity of people living on the banks of Mekong River through raising Official Development Assistance (ODA) funding and private investment. It also proposed the Ministry of Construction and Ministry of Planning and Investment to establish a green climate fund, sourced from businesses and the government, to help vulnerable coastal communities adapt to climate change, she added. Australia is ready to cooperate with Vietnam in seeking solutions for challenges faced by the Mekong Delta, Australian Ambassador to Vietnam Craig Chittick said, noting that the country commits to provide Vietnam its methods for economical use of water resources in rural areas and effective management and use of water in the Mekong Delta. Australia will also work with the University of Can Tho to share expertise in agriculture and technology to help farmers in the region cope with impacts of erosion, saltwater intrusion, land subsidence and water shortage, he said. Eric Sidgwick, Asian Development Bank (ADB) Country Director for Vietnam, revealed that the bank has included Vietnam in its climate change programme from 2016-2030 that has a total budget of about 20 billion USD. Additionally, it will carried out an urban development project in the Greater Mekong Sub-region in six areas, including transport infrastructure, he stated.